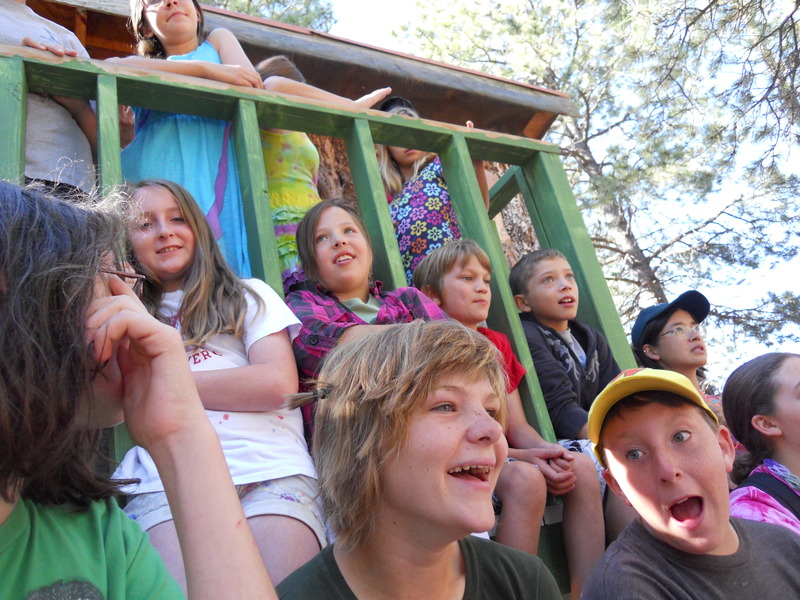 Join Friends in Colorado and New Mexico, and virtual connections across the country today for sharing greetings, news and raising funds for Mountain Friends Camp 2019! The specific purpose of our fundraiser is to help buy a washer and dryer (a target amount of about $1,000), so we can stop sending staff off to town for laundry. Any additional amount raised will go to our campership fund! Santa Fe: COME ONE AND ALL! Santa Fe Monthly Meeting (directions) is hosting a “Bet You Can Do It” ASIAN BUFFET to raise funds for MFC. We’ll hear from young friends and camp staff about their time at camp, and connect with the virtual all camp get together. 630 Canyon Road, Santa Fe, NM. 12 pm. The SYFs (many of whom are past campers) invite you to join them and other Friends for a delicious pancake lunch, and learn more about Mountain Friends Camp! 825 Upland Avenue, Boulder, CO. 11:30 am. Our goals are to raise $1000 for a camp washer and dryer for 2019, get more people excited about coming to camp this summer, and have FUN! 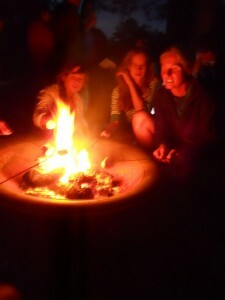 Family Camp News-Single Parent Camperships and More! We still have plenty of room in our family camp session, July 26-29, so please help us spread the word! Are you a single-parent who would like to bring your family to camp? 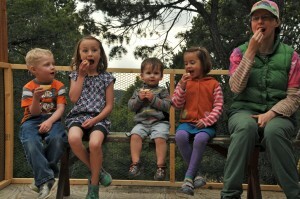 A MFC donor has generously offered full camperships to help single-parent families. 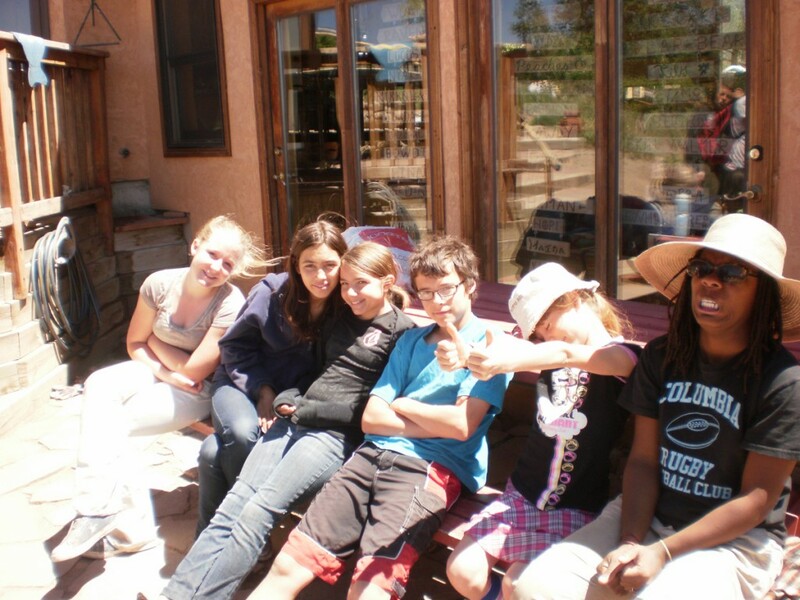 We also have partial camperships available for any family for whom cost would be a barrier, we want everyone to be able to attend Mountain Friends Camp! Thanks to Brooke, Brad, Beverley and the Santa Fe Meeting for organizing a visit and photoshoot at the Tree House Camp this spring! Mountain Friends Camp thanks the Mountain View Friends Meeting for your warm hospitality during our annual board weekend March 20-22. Board members were joined by campers, young adult staff and a few interested local Friends for a fun weekend of worship, discernment and plork (play+work) for our Quaker summer camp. Nine of us traveled from four states plus DC, and nine came from around Colorado. Our focus for the weekend was visioning and planning the next 5 years. We spent time considering the locations we’ve held camp at so far and what we need and want in a permanent location (and how to discern the difference between needs and wants!). Our recent 501(c)3 status, camp policies, staff orientation, support for grieving campers, 2015 plans, finances and outreach kept us busy. We divided up board tasks into three main committees for the next year, and invited campers and others join and participate in committee work. 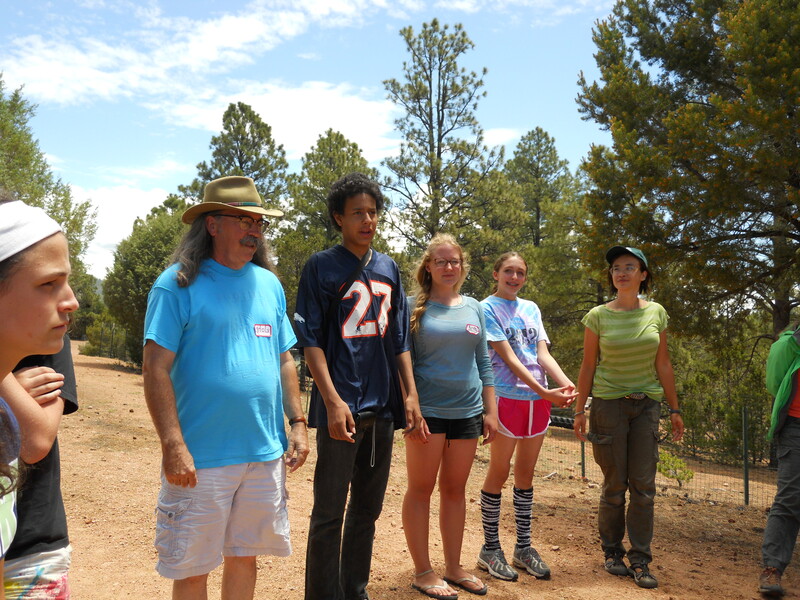 Of course since this was about camp we also had great food, singing, games, worship, fellowship and outdoor time in the beautiful Colorado sunshine. Big thanks to Paula and to Ruth for hosting so many out of towners, and to Penny and Judy for bringing us delicious that gado gado dinner Saturday! Most everyone stayed for Meeting for Worship on First Day, with a few of our camp staff taking the First Day group to the park for some camp games. Afterwards we enjoyed a bountiful potluck spread, and showed some pictures for a MFC Q&A. We left with warm hearts and renewed resolve from the many reminders of what we love about Mountain Friends Camp! I hope this letter finds you well and surrounded by love, light and laughter, wherever you may be. As the land sleeps and the days begin to lengthen, the MFC board is busy planting the bulbs that will grow into next year’s camp. We are so grateful to all the campers, families, staff, volunteers and donors who share their light with us each year. If you have one of those in your family, give them a big hug from us! In this cozy season of gratitude, my own little family gives thanks for many things ~ among them our far-flung Quaker community, and Mountain Friends Camp. Even now, my 10-year old son Orion is singing snatches of MFC songs, regaling me with stories of camp that I have heard a dozen times, and planning epic skits for next year. (Anybody else remember “Manhattan Friends Camp”? Or Ana and Ari’s anniversary? Or spaghetti tacos!!??) In preparation of the new year, his father and I are also thinking of next year’s camp ~ the saving, prioritizing, and late-night conversations are well underway. What will best serve his growth as a person? Fun. It’s fun. Like, really fun. Plork. Plork is so cool! Quaker Values. Nowhere else in his life encompasses the Quaker values of peace, community, simplicity, integrity, equality and stewardship all at once. Inner Light. MFC nurtures the light within him and strengthens that quiet inner voice so essential to a meaningful life. Staff. The staff is extraordinary ~ we want him to grow up to be like them! Teenagers. The teens at MFC are as rare and precious as gold. Where else can he learn to navigate the coming waters of teenhood with graciousness, simplicity, playfulness and service? They are silly, kind, thoughtful, and hard workers. They love themselves, each other, and the littler ones. He may not know he is looking up to them, but we do, and we are so thankful. Relationships. 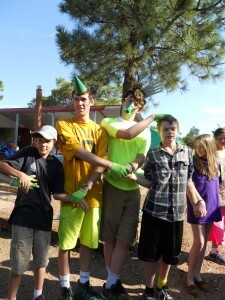 Orion is building long-term relationships at MFC with staff and other campers. Friendships based on Quaker values will help him keep a calm center in the storms of life, and give him friends all over the country who care about humanity, ecology, and service as much as he does. So yes, Mountain Friends Camp is important to us.But here’s the thing:without scholarship help, MFC would not be a priority; it would be a pipe dream. Twice now, MFC has come through with scholarship assistance for us so that Orion could attend. Thanks to generous donors all over the region, (and some help from his grandparents) we have twice been able to say “Yes!” to Orion and watch him caper about the living room in delight. I am now honored to serve MFC in return by sitting on the board and working to make sure that every child who wants to can come to camp. I learned that Mountain Friends Camp has not turned away a request for financial assistance yet, and I hope we never have to ~ times have been hard and Orion might need assistance for another year as we get our feet under us. And there are far needier families than we, with children who have only dreamed of going to summer camp, for whom Mountain Friends Camp could be an island of peace and play in a year of hardship. As lights of gratitude and celebration are sparkling within homes and hearts all over the world, please consider sharing some of your light with MFC in the form of a donation. Our financial needs are modest but substantial, as we work to insure that MFC can continue to welcome an increasingly diverse group of young people. In 2015, over 50% of campers received need-based financial aid, and we plan to increase our outreach to under-served communities in the region. One of the testimonies we value at camp is stewardship~ of our precious environment and our own resources as a community. 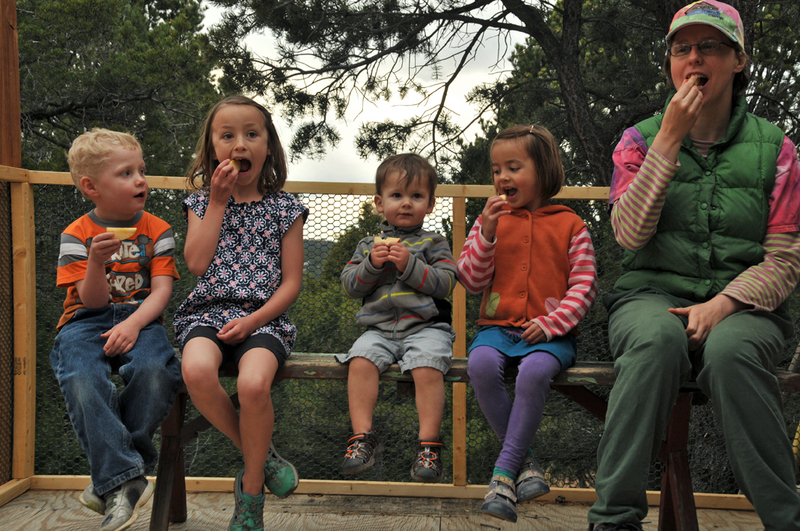 We envision a future in which my 3-year old will share his brother’s experience at camp, and their children will one day come home from Mountain Friends Camp with stories of their own. After four locations in three states in our first five years of camp, we dream of a home for MFC where we can settle in and focus on nurturing the light in each generation that comes our way. -$5,800 will pay for our space for this summer! Click here to visit our donations page, with options for donating by check or online via Paypal, as well as matching and other forms of donation. Thank you all for sharing with us in all the ways that you do, and we hope to see many of you this summer! 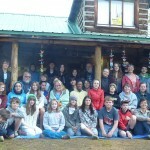 Mountain Friends Camp 2014, reflections from campers and staff. help; we were able to maintain relatively silence for an hour a day for the seven days I shared. 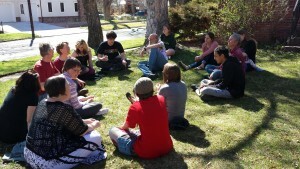 I was impressed and the spirit-lead communication during meeting for worship felt inspired! After the hour of silence we had time for affirmations and conflict resolution. It was so effective to start with praise and frame conflict in solution focused communication. It worked and conflicts were resolved, while (F)friends were held in the light as afterthoughts and forethoughts when conflict emerged. (F)friendships were forged and the entire time was both exhaustive and inspired in ways that will stay in my heart for years to come. I felt some irony as the continuing committee representative advocating for non-support, while I personally benefitted so greatly from camp. I have decided to ask Las Cruces Meeting for Worship (with the intention of business) to reconsider our choice and include this funding in our IMYM allotment. I think the way to raise Quaker kids is to support them- even if we don’t directly benefit from this support. Knowing that this is happening creates a sense of peace in my heart in ways that I cannot express. I would invite us all to have such an innocent and invaluable experience. Not exactly one paragraph but as close as I can get. “There are so many amazing aspects of camp it’s going to be hard to just pick a few. Though I’m sure we all missed Tin Cup, the site was beautiful. I loved all the hikes and getting to sleep several feet off the ground was quite enjoyable. And last but not least, it’s the people that make that wonderful place what it is. From the youngest camper to the oldest coordinator/visitor, each and every person contributes their own spark that makes the camp glow with an irresistible warmth. For me what makes MFC a Quaker camp is the undeniable sense of equality. It’s amazing, a 5th grader can feel comfortable talking to a senior in high school, which definitely is not something that happens often in an everyday setting. MFC no doubt,has effected me as a person, and as a Quaker. When I get back from camp I seem to forget that not everybody out there has the same beliefs as I do. I see people saying awful things to each other and physically harm them as well. It’s hard to watch,but i try to keep up that never ending feeling of love at camp for even the people who were the ones harming others. With that said, since I got back from camp I have sometimes gotten strange looks for my numerous hugs. And last a thanks to CO Regional Meeting for their support and donations. It’s so amazing for them to do so. I hope that the donations continue and that they know how much we appreciate their support. How Time Flies, When You’re Growing Quaker Leaders! 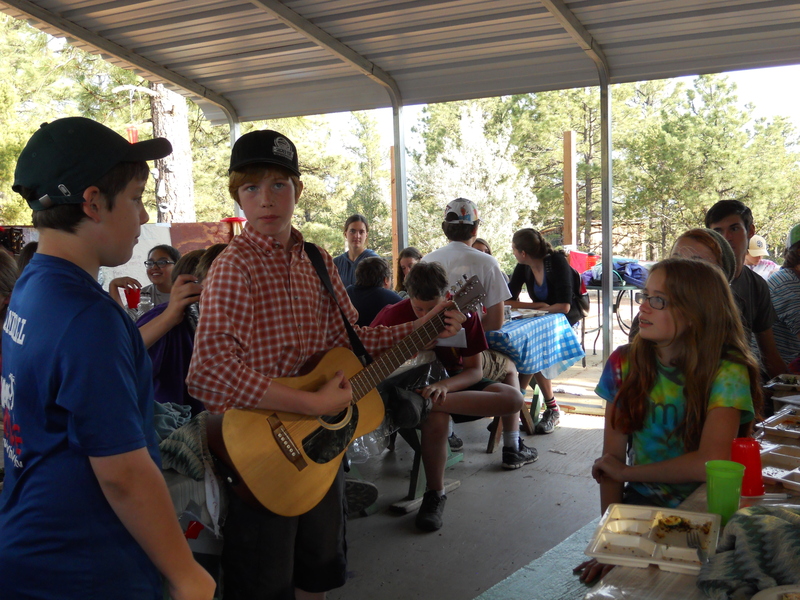 Mountain Friends Camp 2013 is quickly approaching. We’re putting together another amazing group of summer staff, including some of our favorites from 2012 and newcomers from outside the IMYM sphere. Camper registrations are coming in fast as well. There are only 5 more spots for week one, so if you’ve been meaning to register, send in your paperwork or contact me today! 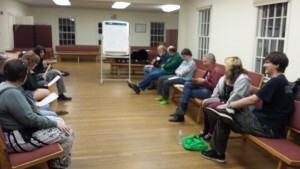 We had many goals in mind when Mountain Friends Camp was nothing more than a blip of a committee and big dreams-living Quaker testimonies, deepening our spiritual connections, playing cooperatively, working joyfully, increasing nature intelligence, changing the paradigm-and a central component was growing Quaker leaders. I know I have grown in my four years as a summer camp director, and I’m so proud to see the commitment, compassion and creativity our campers and CITs bring to the camp community. We are lucky to have them at Mountain Friends Camp, and I know they let their inner Light shine wherever they go.